yesterday i had the pleasure of leaving work early to escape into the streets. it’s beautiful here in seattle right now and the last thing i want to do is be cooped up in anything. it’s terrible that trapped feeling. i saw a theater performance last night by implied violence. there was a cage to one side of the performance space made of chicken wire. appropriately, they had a lot of baby chickens in it. my friend lindsey kept murmuring about wanting to take one home and bent down to pet them. i don’t pet chickens. i think they smell bad and i have been attacked by roosters one too many times to have any desire to play with them. and i have seen them do spectacular things, but i still don’t want to touch one. so i wandered down to pioneer square. it’s an older part of seattle’s downtown where once all the migrant and poor white labor lived and worked. you could go to a dance hall and buy yourself a lady from the phillipines for the night. number girls they called them because they wore little numbers on themselves as identification. choose a number. take a number. it’s a numbers racket. number girls. it was also where the whore houses were if you hadn’t guessed. i guess all those guys chopping down trees and refining them needed some kind of comfort. they were living in shanty towns on the edge of the city. hooverville is what it was called, the shanty. i don’t know why (editor’s note: president hoover was the president at this time, the great depression, and was blamed for the economic malaise, thus the populace named these rag and stick villages after him. metonymy in action or polysemy?) . i suppose i’ve heard before, but i just don’t remember. 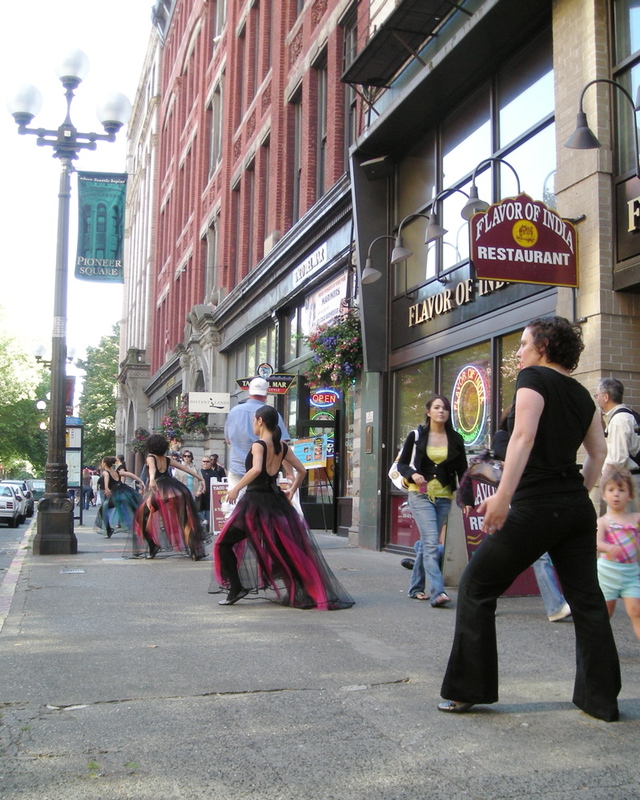 all the stories of that place, old pioneer square, sound miserable. nothing to romanticize here, folks; keep moving. keep moving. no wonder that this is one of the places from which the american labor movement rose. but yesterday was a brighter day. 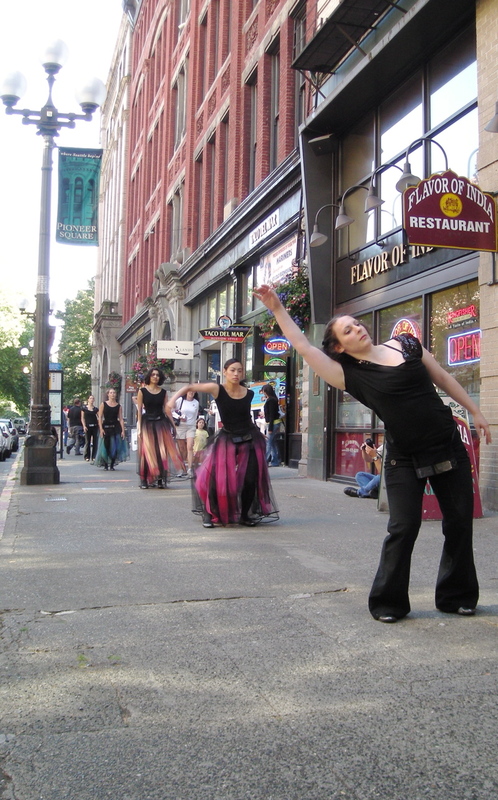 yesterday, on 1st avenue between yesler and western avenues at a little after 5 pm, i saw a group of dancers walk down the street and stake a claim to a section of sidewalk. they were wearing very lovely dark hued costumes reminiscent of ballerina wear. small black shoes and hose. little bubbles of fabrics forming down from their waists. bare headed like frivolous nuns and never really smiling, they formed a single file line down the street. buttressed by two not so matronly matrons dressed as ushers, i think, bookends, maybe, to the dancers. the dancers also had on these curious mesh aprons. really small ones. if you looked close enough you could see a couple of small speakers inside them. i didn’t notice any wires going to soundboxes so maybe they were using a radio broadcaster to get their sounds. i’ve done shows like that before and it’s a pretty exciting way to sonify a piece. when you perform in the streets in america it’s really quite different than dancing or playing music in other countries. people react with an attitude that almost borders on hostility. they will make nasty comments. they yell stupid things that don’t really amuse their friends, but helps to diffuse the weird tension that americans have about street performers who aren’t clowns, breakdancers, folk musicians and those guys who use buckets for drums. it wasn’t so bad for the 5 ladies in esse aficionado and i suppose it’s because they looked so dazzling in those outfits and they never did smile. not smiles like you think of smiling, anyway. the tall woman in the middle kept looking as if she was going to grace us with some kind of bounty of joy, but she resisted and the mirth just seemed to play about her lips and eyes. i should probably say something about their dancing. the 5 of them were in a line going down the sidewalk. motions were synchronized and generally began with one dancer at either end or the principle choreographer, who was the second person in after the matron closest to me, starting some gesture. an arm would go up here or a leg and then you could see it move through all of them. but it would take on a slightly different form depending on the body or personality of the mover. and that is pretty wonderful. i have only seen one other piece by this group, but i liked it so much i went twice. this piece, late saturday afternoon: portrait, is an extension of that one, early sunday morning, and something i can say about it is that the choreographer, maki morinoue, has brought some movement of the birds to her work that i find enchanting. so watching these movements move serially from one body to the next, even though it’s something you see in a lot of performances, is not tiring or boring or cliched. it just feels very dream-like and almost but not quite sensual. or maybe that’s just me. i have always loved bringing art that normally is done in theaters out into the public. it’s so fun to watch how people react. a lot of performers get turned off because it can be emotionally hazardous what with all those random folks making the occasional disparaging and loud remarks or doing mock versions of what you are up to, but for the people who are hungry for this sort of thing it’s pure joy when we stumble across it. i should also say something about the musical element. as i mentioned before, the dancers were wearing these mesh aprons with very small speakers inside. the sounds of bells and gongs would come from them sometimes. other times it was children laughing. this seemed to really resonate with the crowds who gathered and the crowds who passed. looking at the sandwich board the matrons had set down as the group occupied their piece of the sidewalk i saw that the music was composed by morinoue. this is the choreographer’s last name, but i am not sure if she is being humble by identifying herself in this way or if this is a special name that connotes something else or something more. but it doesn’t really matter because the final notion i have is that the sounds played were well chosen and their sequencing was a choreography in itself.